I know the cost of going to the salon gets higher and higher, so I don't go very often. I trim my own hair most of the time. ( If that makes me sound cheap I'm sorry) i cut my son's and some of the grandkid's hair too. I have thought about buying a few of those handy hair cutting gadgets, but they look a little confusing and honestly I'm not so sure I'd be better off using one. I was given opportunity to try out this Hair Cutting Set and it was so straight forward I knew I could use it without issue. 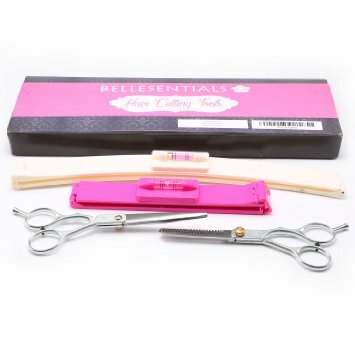 The set comes with a pair of scissors, a pair of thinning shears and 2 cutting guides. One of the cutting guides is small, this one is for cutting your bangs. The other guide is larger and used for cutting the length of your hair or for layers. I really like that there is a level on each of the cutting guides to insure a perfectly straight cut. The guides clamp firmly in place so there's no slipping while cutting. One thing I don't like about going to the salon is it seems no matter how much I tell the hairdresser I want cut off, there's always more cut than I wanted, now I feel like I'm in control and never have to have that complaint again.